Bangalore Rural Lokasabha Constituency constists of 8 MLA constituencies. They are Ramanagaram, Channapatna, Magadi, Kanakapura, Kunigal, Raja Rajaeshwari Nagara (Bruhat Bangalore Mahanagara Palike), Bangalore South & Anekal. 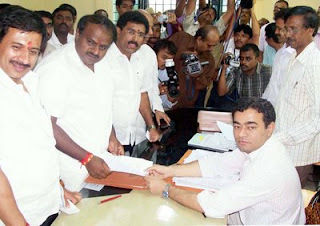 Former Chief Minister of Karnataka Mr. H.D.Kumara Swamy has filed his nomination papers as Janata Dal (Secular) candidate. 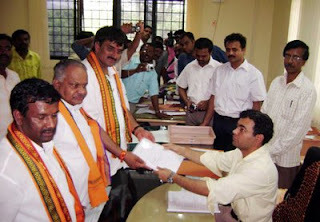 C.P.Yogeshwar who was sitting MLA of Channapatna representing Congress resigined as MLA, quit Congress has joined BJP. BJP has fielded him as the party’s candidate against H.D.Kumara Swamy. 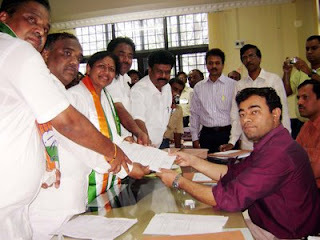 Immediate past MP Tejaswini has put in her nomination papers for re election. While H.D.Kumara Swamy is known as the man for development throughout the constituency. Tejaswini as Member of Parliament did very little better put as negligible developments is the general perception among the voters. BJPs candidate a 3 time MLA of Channapatna is popularly known throughout the constituency for wrong reasons. He is said to have cheated scores of people on pretext of giving residential sites. The Election is scheduled on 23rd of April 2009. Ramanagara District Deputy Commissioner Mr Manish Moudgil who is known as the man who follow law strictly is the Returning Officer of the constituency. He has already taken tough measure to conduct the elections free and fair.